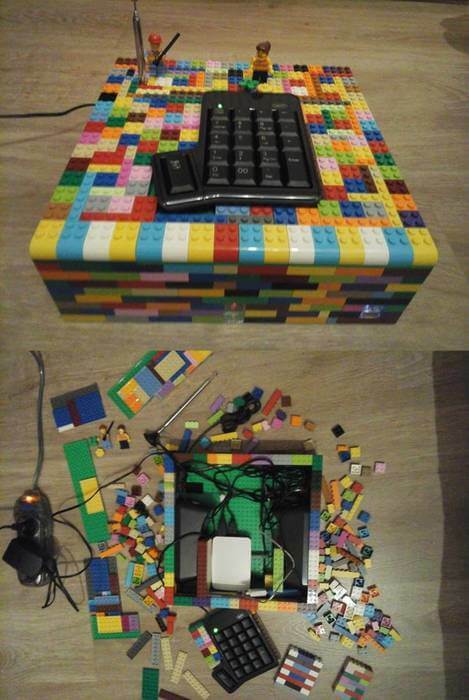 Thank you to RTL-SDR.com reader 'JJ' for writing in with a submission for his Lego Pi Radio. JJ's Lego Pi Radio consists of a Raspberry Pi and RTL-SDR and is designed to be an FM Radio, MP3 and internet radio player all in one, with a cute enclosure made out of Lego bricks. The radio is controlled by an external numpad which allows for a number of presets to be chosen from. The internet radio and MP3 players are handled in software by VLC player and a script written by JJ is used to map the numpad to RTL-SDR FM presets, or MP3 and internet radio functions. The whole unit is run headless and if anything needs to be updated such as internet radio links, JJ simply accesses the unit via an SSH shell. JJ also writes how he had to try 3 different brands of speakers before he found one that could be driven directly from the Pi with adequate sound quality. In the future he hopes to add a bluetooth remote. One problem that JJ found was that the standard rtl_fm did not produce high quality audio. Fortunately he found the NGSoftFM software which is capable of outputting high quality FM stereo sound and is compatible with RTL-SDR dongles. In the past we've seen a similar project that was implemented on a BeagleBone Black. The idea in that project was to switch between FM and internet radio depending on the reception quality.